Why should you go on an Everest Base Camp Trekking? The best and closest views of Mt. Everest and other mountains over 8, ooo m.
See ancient monasteries and Buddhist culture with Festivals nearby. Experience "Namche Bazzar" a traditional market in the highest place of Nepal. Share in the lifestyle and culture of Sherpa Communities. What are the major attractions of Everest Base Camp Trek? 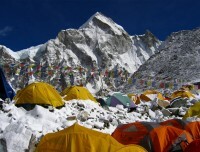 Everest base camp trek is a grand excursion through the picturesque Khumbu valley. It is a world-class adventure trekking trip through the land of the Himalayan prominences praised by hikers and mountaineers. 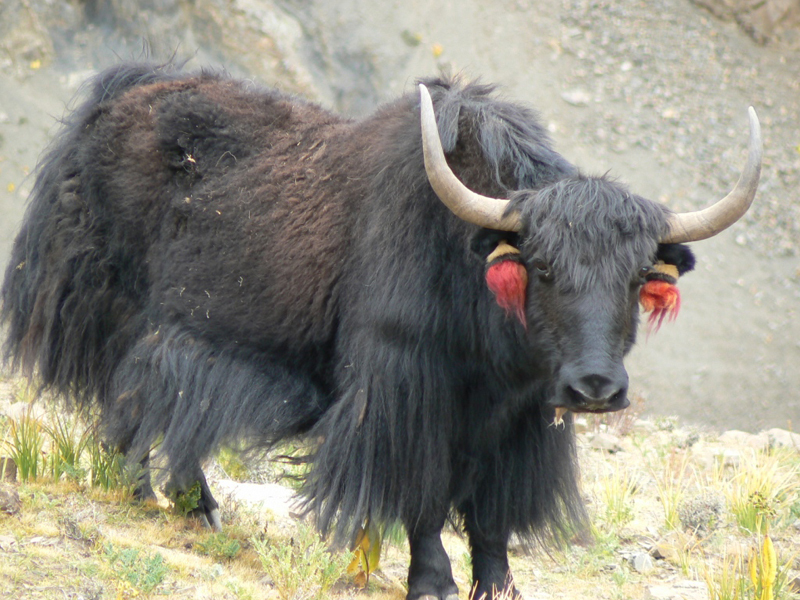 The natural attractions of the Himalayas, forest, and rare wildlife found in the alpine region along with the Sherpa culture, heritages and hospitality have made this trek the most popular excursion in the Himalayas of Nepal. The trek to Everest base camp begins from the tiny airstrip of Lukla. 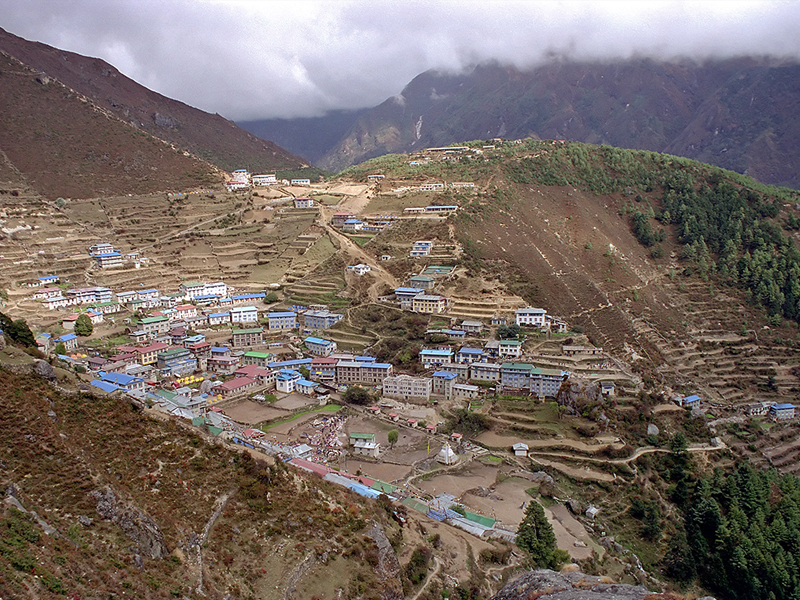 Passing through beautiful forest and fields, you climb to the densely populated villages of Sherpa people- Namche Bazaar and Khumjung. You will explore Sherpa culture, traditions, monasteries, chortens, mani walls and hospitality. The trek to Everest base camp leads you to the base of the world’s tallest peak- Mt. EVEREST. The journey is the epic trip to Everest base camp introduced by the Everest climbers Tenzing Norgay Sherpa and Sir Edmund Hilary. 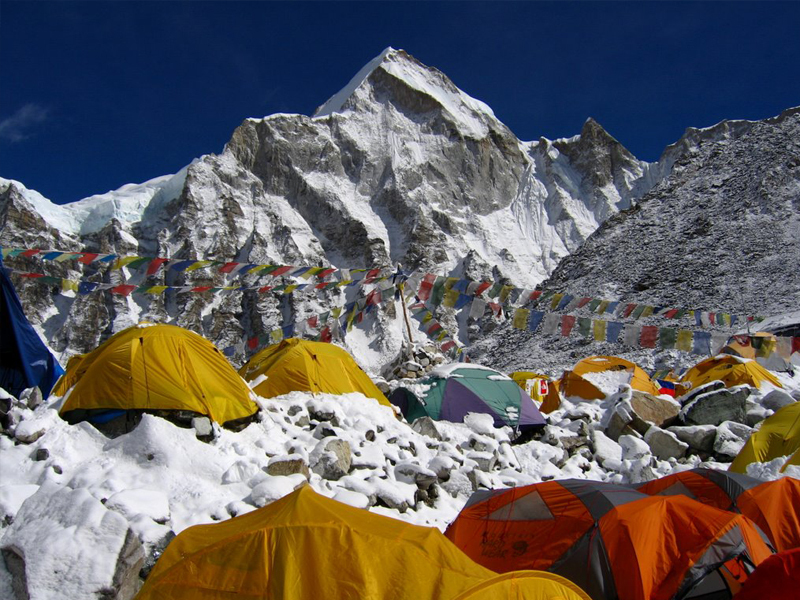 During the Everest base camp trek, you will get an opportunity to explore the area around the 8000 meter peaks Mt. EVEREST, Lhotse, Nuptse and Makalu. 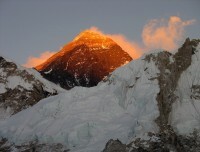 Other spectacular peaks are Ama Dablam, Baruntse , and many other peaks that are much taller than the Alps or Rockies!. The views of the Khumbu Icefall and glacier are brilliant. Reaching Gorakshep, you take a hike to the Everest base camp and Kalapatthar which are beautifully nestled in the surrounding white peaks. Acclimatization is required for this trek. Alpine Excursion Treks and Expedition will arrange the entire trekking package with your suitable itinerary. Note: It’s better to manage an extra day if you are trekking in the Everest region due to the flight to Lukla. Sometimes, the weather may interrupt the regular flight. So, it’s better to arrange a reserve day. Day 05 : Rest day and visit Khumjung valley and come down to Namche. Day 09 : Hike to Gokyo Ri (5357m) and return to Gokyo. Day 14 : Early morning ascend to Kalapatthar (5550 meters) and return to Gorakshep. Day 16 : Trek to Pangboche (3910m). 6-7 hrs (visit the oldest monastery of the Everest region). What are the visa requirements to visit Nepal? Do we need any special permit to visit Everest Region trek? Alpine Excursion Treks and Expeditions leads Everest Base Camp Trekking with a complete arrangement of professional guides and porters along with other required services. All you need is Pack your bags and all your requirements for the best trekking experience in Nepal are arranged by our professional team. Day 01Arrival in Kathmandu Namaste and welcome to Nepal. Alpine Excursion Treks and expedition's representative welcome you warmly at the Tribhuwan International Airport and transfer to the hotel. You take rest and enjoy your meal in the evening. Overnight at Hotel. Day 02Sightseeing (Shopping) day After the breakfast, you set out for the sightseeing trip in the Kathmandu valley. Our expert tour guide shows you the UNESCO world heritage sites, which include Pashupatinath (the Hindu temple), Boudhanath (Buddhist stupa), Swayambhunath (Buddhist stupa and temple). Then, return back to the hotel. If you have to shopping, you have time to do. Overnight at Hotel. Day 03Flight to Lukla (2840 meters) and 3 hours trek to Phakding (2610 meters). 35 min fly/3 hrs walk We fly to Lukla early in the morning with the breathtaking views of the Everest Himalayan chain. In Lukla, we meet our further crew (if you required) and arranging the things, we proceed to Phakding, walking above the Dudh Koshi River and enjoying the valley views, potato fields and the forest. Overnight at lodge. Day 04Trek to Namche Bazaar (3440 meters). 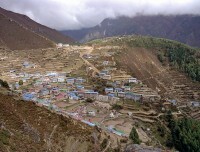 5-6 hrs Today, we walk almost up and up to the Sherpa hub, known as Namche Bazaar. First we cross few suspension bridges and enter to the Sagarmatha National Park. The gradual uphill walk is exciting with the greenery views of the forest and we get the first glimpse of Mt. Everest. Reach to Namche Bazaar and take a rest. Overnight at lodge. Day 05Rest day and visit Khumjung valley and come down to Namche. As we are climbing to the alpine region, we need acclimatization to fit in the thin air region. After breakfast, we walk around Khumjung and Khunde. On your interest, we can walk up to the Everest View Hotel. Then we come back to Namche Bazaar. Overnight at lodge. Day 06Trek to Dole (4110 meters). 6-7 hrs From Namche Bazaar, we gradually ascend to Dole via mong, Phortse Thanga Tangwa Kharka. It is almost all the way uphill trail and the views become more fabulous. The alpine meadow begins and we pass the dense woods on the way. On the way, we pass the birthplace of Lama Sange Dorje. Overnight at lodge. Day 07Trek to Phangga (4480 meters). 5-6 hrs We have uphill trail even today. The walking becomes gradual as we are getting into the high altitude. From Dole, we reach to Kele, Labharma, Luza and passing Machhermo, we reach to Phangga. It is located just close to the avalanche area that took place in 1995. Overnight at lodge. Day 08Trek to Gokyo (4790 meters). 5-6 hrsThe real wonder and an exciting excursion to the stunning Gokyo valley begins after the breakfast. 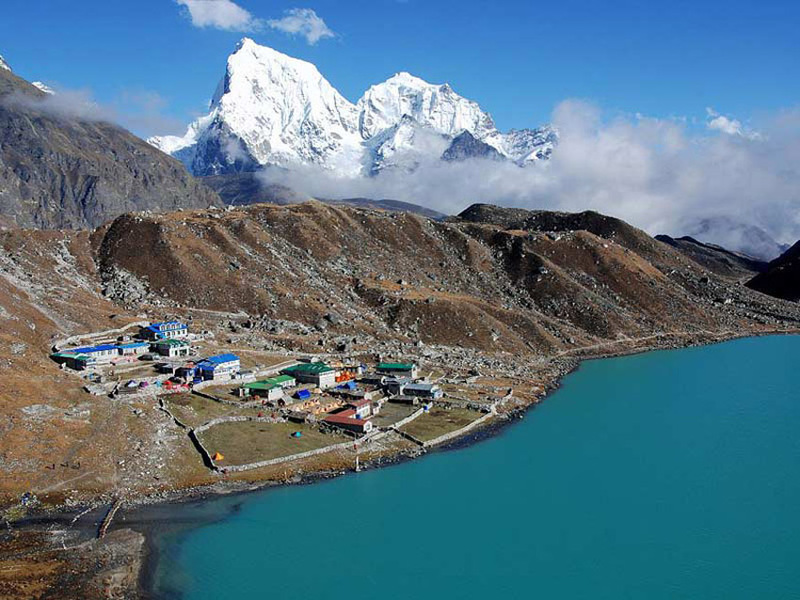 We pass two Lakes, named Longpongo Tsho and Taujung Tsho and finally reach to the Gokyo valley, which is beautifully situated beside the Gokyo Lake, which is known as the third lake. The Janai Purnima fair is held beside the Lake every year. Overnight at lodge. Day 09Hike to Gokyo Ri (5357m) and return to Gokyo. Early morning, we begin to hike towards the Gokyo Ri. It is an exciting viewpoint of the Everest, Makalu, Cho Oyu, Lhotse and the vicinity peaks. The Ngozumba glacier adds more attraction on the trek, which is the longest glacier in the Khumbu region. We can enjoy climbing the Gokyo Peak and gradually retrace to the Gokyo valley and take a rest. Overnight at lodge. Day 10 Trek to Dragnag (4700 meters). 3-4 hrs We leave the Gokyo valley and head towards Dragnag after the breakfast. Enjoying the views of Makalu, Lhotse, Kusum Kanguru and the neighboring peaks, we head continually. We are on our next mission that is crossing the Cho La Pass, before that we take a rest at Dragnag. Overnight at lodge. Day 11Trek to Cho La Pass (5368 meters) and descend to Zongla (4830 meters). 7-8 hrs Before the sun rises, we begin our grand excursion towards the Cho La Pass. It is challenging enough to deal with. The top of Cho La 5368 meters is a wonderful viewpoint of the peaks of the Khumbu region, including Mt. Everest, Ama Dablam, Cholatse, Lobuche peak and others. Crossing the Cho La Pass becomes highly challenging in winter due to the high snow fall. However, even in the normal season, there can be snow and the route becomes slippery and special attention should be paid along with using some basic climbing equipments. Then we climb down gradually to Dzongla. Overnight at lodge. Day 12Trek to Labuche (4990 meters). 5-6 hrs The previous experience of passing the high pass, we find it easy to deal the gentle trekking trail though in the alpine altitude. With the physical fitness, we walk gradually From Dzongla to Labuche enjoying the views around, of the mountains and the glaciers. Thamserku, Kangtega and other peaks can be seen frequently. We reach to Labuche and take a rest. Overnight at lodge. Day 13Trek to Gorakshep (5140 meters). 5-6 hrs The uphill trail becomes challenging with the increasing altitude. We pass the Italian Research center and cross the Lobuche Pass at 5110 meters and finally reach to Gorakshep. Overnight at lodge. Day 15Trek to Everest Base Camp (5300 meters) and return to Thukla (4620 meters). 6-7 hrsWe hike to the Everest Base Camp this morning through the new moraine route. On the way, we can see the fabulous views of Pumori, Nuptse and other stunning peaks. Everest view today is available only before reaching to Everest Base Camp. The trail is not that much technical, but the higher altitude makes it tough. Then, we descend to Gorakshep. Overnight at Lodge. Day 20Fly Back to Kathmandu Today, we fly back from Lukla to Kathmandu enjoying the Everest region snow covered peaks. From the airport, you will be transferred to hotel. Then you have a whole day for shower and rest. Overnight at lodge. 3 Night hotel in Kathmandu 3 Star level Hotel (Breakfast & Bed) plan. 18 days trekking wages of necessary staffs. Transportation in Kathmandu for Airport to Hotel and Hotel to Airport by private vehicle. Air Ticket for Guest, Kathmandu to Lukla and Lukla to Kathmandu. Air Ticket for Guide Kathmandu to Lukla and Lukla to Kathmandu. TIMS (Trekking Information Management System) fee.